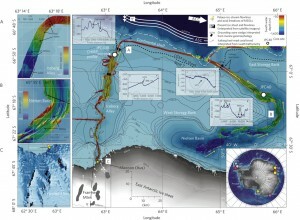 Schematic figure of geomorphology on the continental shelf around the Antarctic Peninsula. From Davies et al., 2012. The sea floor around Antarctica holds a great deal of information about past glacial behaviour, and by analysing the glacial landforms here, it is possible to obtain a great deal of information. By using multibeam swath bathymetry (where the ship emits sonar ‘pings’ and collects their reflection from the sea floor; see information from Woods Hole), it is possible to image the sea floor. The continental shelf around the Antarctic Peninsula is a veritable treasure trove of glacial landforms, formed during the last glaciation of the region. Some of these landforms indicate that the continental shelf was criss-crossed by ice streams that lay in deeper bathymetric troughs during the last glacial maximum. In the Amundsun Sea Embayment, into which Pine Island Glacier drains, multibeam swath bathymetry has captured beautiful images of moraines, mega-scale glacial lineations (see work at Sheffield University) and drumlins. The geology of the continental shelf poses a considerable control on the formation of these glacial landforms. Hard crystalline bedrock on the inner shelf have been moulded into short drumlins and incised with meltwater channels. On the outer shelf, soft sedimentary strata have been moulded into long mega-scale glacial lineations. What are Mega Scale Glacial Lineations (MSGLs)? MSGLs are long, elongated landforms made typically in soft sediments that reflect fast ice flow of an ice sheet. Indeed, MSGLs are often thought to be indicative of ice streaming, and are found all over the world on previously glaciated areas. In a seminal paper, Clark et al. 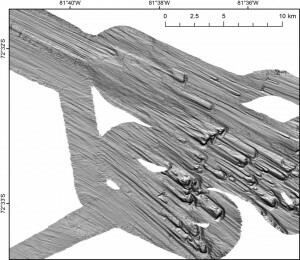 1 described MSGLs as linear forms 10,000 to 100,000 m in length, which are most easily observed from aerial photographs or satellite images. They characteristically have length:width ratios of greater than 15:1 and have a convergent flow pattern2. MSGLs typically have a large zone of convergence, feeding into a main trunk, which then diverges again near the ice margin. The elongation ratios of some MSGLs, such as those reported in the Dubawnt Ice Stream in Canada, are up to 13 km long and have elongation ratios of up to 43:1. Cross-cutting relationships with drumlins helps scientists to reconstruct complex ice-flow pathways, which is important for understanding ice-sheet evolution. Mapping the location of former MSGLs is important, because it helps scientists to understand the former configuration of the great ice sheets during the last ice age. Ice streams are important because they drain large parts of the Antarctic Ice Sheet today, and are capable of changes in their velocity and drainage. During the Last Glacial Maximum (LGM), the East Antarctic Ice Sheet was larger (but not necessarily thicker) ice sheet than present, and in many places it extended out onto the continental shelf. Studying East Antarctic Ice Sheet retreat at the end of the last ice age, when the Earth underwent a period of rapid warming, is important for understanding and modelling how ice sheets might react to a similar rapid increase in atmospheric and oceanic temperatures in the future. Mackintosh et al. (2012) investigated ice sheet retreat around Mac. Robertson Land, East Antarctica, where they found highly attenuated MSGLs in Nielson Basin and Iceberg Alley, reflecting the presence of former ice streams. 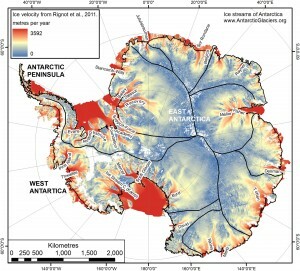 The ice sheet was grounded > 1 km below modern sea level3. Grounding Zone Wedges (GZWs) and MSGLs from Mac. Robertson Land, East Antarctica. From Mackintosh et al. 2012 (Nature Geoscience). Reprinted by permission from Macmillan Publishers Ltd: Nature Geoscience. (Mackintosh et al. 2012), copyright 2012. 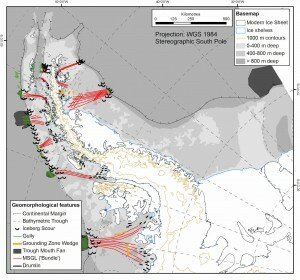 MSGLs in Iceberg Alley are confined to the deeper part of the trough, but in Nielson Basin, MSGLs and therefore ice streaming occurred throughout its trough. The maximum extent of the ice sheet is indicated by grounding zone wedges, large wedges of sediment that build up when the ice margin is at a stable position for a sustained period of time3. These Mega Scale Glacial Lineations were imaged using multibeam swath bathymetry, which you can read more about at the Woods Hole Science Centre. Belgica Trough Mega Scale Glacial Lineations, Antarctic Peninsula. Figure provided by Dr Stephen Livingstone. Around the Antarctic Peninsula, extensive MSGLs record the presence of multiple ice streams during the LGM. On the Antarctic Peninsula continental shelf, the inner shelf is typified by irregular, erosional forms cut into crystalline bedrock; the mid-shelf is characterised by drumlins and more elongated forms, and the outer continental shelf is characterised by widespread, elongated MSGLs. These MSGLs are formed in deep, soft sediments deposited on the Antarctic Peninsula continental shelf during the last glacial cycle4. The MSGLs lie in topographic lows. These bathymetric troughs served to funnel ice during the LGM, with fast-flowing ice occupying the troughs and depositing large sediment trough-mouth fans at the continental shelf edge. Mega scale glacial lineations are particularly well developed in Belgica Trough, as you can see in the picture below, kindly provided by Dr Stephen Livingstone from Sheffield University. This figure shows drumlinoid bedforms, which are shorter and more pronounced, feeding into elongated lineations behind. These bedforms were produced in soft sediments on the ocean floor by the Belgica Trough Ice Stream during the Last Glacial Maximum on the Antarctic Peninsula. There is lots of information on drumlins and MSGLs on Chris Clark’s webpages at Sheffield University. 1. Clark, C.D. Mega-scale Glacial Lineations and Cross-cutting Ice-flow Landforms. Earth Surface Processes and Landforms 18, 1-29 (1993). 2. Stokes, C.R. & Clark, C.D. 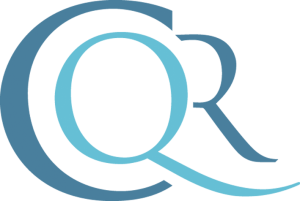 Are long subglacial bedforms indicative of fast ice flow? Boreas 31, 239-249 (2002). 3. Mackintosh, A., Golledge, N., Domack, E., Dunbar, R., Leventer, A., White, D., Pollard, D., DeConto, R., Fink, D., Zwartz, D., Gore, D. & Lavoie, C. Retreat of the East Antarctic ice sheet during the last glacial termination. Nature Geosci 4, 195-202 (2012). 4. Davies, B.J., Hambrey, M.J., Smellie, J.L., Carrivick, J.L. & Glasser, N.F. Antarctic Peninsula Ice Sheet evolution during the Cenozoic Era. Quaternary Science Reviews 31, 30-66 (2012).